Despite a previous commitment that could only be broken by the death of a staff member, Torchlight 2 has been delayed out of 2011. Don't worry, nobody is dead. Runic Games developer Travis Baldree tells all on the official site that a delay into early next year is the best thing for everyone. Obviously quality is a big concern on their part and it seems that Runic doesn't feel what is there is up to their high standards. It might not be 100% delayed because of development issues too, there might be a little bit of marketing behind it. After all - it's the fall gaming season and we have way too much to play already. Besides, you're all playing Skyrim right now anyway, aren't you? Or Battlefield 3? Or Uncharted 3? Or Saints Row 3? Or Arkham City? Or Skyward Sword? Or Minecraft? Or Modern Warfare 3? Or Dark Souls? Or Assassin's Creed Revelations? Those are awesome games. When Torchlight 2 goes live, we want it to be awesome too - all the way through. So there ya have it. You can hear more of the team talking about the delay on the latest Runic Games Fansite podcast. 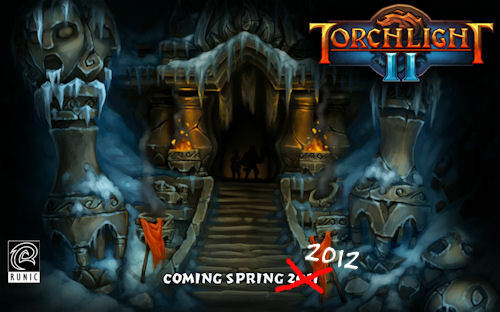 Torchlight 2 will (hopefully) be out in Early 2012 for the PC with 8 player online co-op (or more/less). Page created in 0.4268 seconds.